Sick Of Losing NHL Bets In Shootouts? Here Are 5 Ways To Avoid It! As we said in a previous article about how overtime and shootouts create such headaches for NHL bettors, there aren’t many things more frustrating than losing NHL bets in shootouts. In theory, the shootout wins and the shootout losses should even out over time. But in the short term, when you lose 6 or 7 straight NHL bets because of shootout losses, it can create some real volatility with your bankroll. Letting your emotion get the best of you after a few bad beats (in poker, they call it “going on tilt”) is one of the worst things that can happen to you in gambling. It’s hard to stay disciplined and not chase losses when you feel like you’re overdue to catch a lucky break. Eventually (if it hasn’t happened already), you might get to the point where you decide enough is enough. You don’t want to rip up any more losing tickets while a team that lost in a shootout high-fived and grinned its way off the ice, happy with earning a single point. Fortunately, there are ways to avoid the frustration of losing NHL bets in shootouts. Regulation time betting enables you to simply bet on what happens in the first 60 minutes of the game. Whatever happens in overtime or a shootout won’t affect the outcome of your wager. 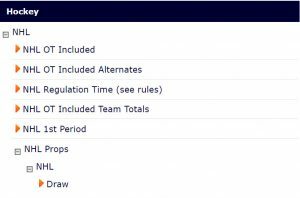 In the screenshot above from www.Pinnacle.com, you can see the two main types of NHL regulation time betting: the moneyline and the handicap. The moneyline is strictly on which team will win the game. Just like any other moneyline bet, you’ll have to risk more to win a unit on the favourite than if you are betting on the underdog. If the score is tied at the end of regulation time, your bet will ‘push’ and your wager will be refunded. The handicap bet requires the favourite to win in regulation time in order for you to win your wager, but you’ll get a better payout on that bet. Or you can take the underdog at +0.5 on the handicap, which means that if the score is tied after regulation time, you’ll win. Pinnacle, 5Dimes and William Hill all offer standard NHL regulation time betting lines. NOTE: We wrote an article that highlights the pros and cons of regulation time betting. The 3 way hockey bet is similar to regulation time betting, except that there’s no push on the moneyline if the game goes to overtime. That’s because in 3 way NHL betting, you pick between three options: Team A, Team B or Draw. If you’re betting on the favourite, 3 way betting is similar to playing the -0.5 handicap in regulation time betting. Your team needs to win in regulation time or you lose your bet. If you like the underdog, however, the underdog getting to overtime won’t be good enough to win your bet. They’ll need to win in regulation time as well, although you’ll get a much fatter payout on that bet than you would on the +0.5 handicap in regulation time betting. The draw (when you actually pick the game to go to overtime) will generally pay close to 3:1 odds. That implies to around 25% probability, which isn’t far off from the 23-24% of NHL games that go to overtime. The nice thing about betting on the draw is that once the game goes to OT, you’ve already won. It doesn’t matter which team wins the game, or whether it goes to a shootout. You can easily find 3 way NHL betting at Bet365, BetOnline, Sports Interaction, William Hill and Bodog. Double chance betting is like regulation time betting and 3 way NHL betting, except that you’re picking 2 outcomes at the same time. There are 3 possible outcomes at the end of regulation: Home team wins, Road team wins, or the score is tied. With double chance betting, you can win your bet if 2 of those 3 possible outcomes take place, and all of them allow you to avoid losing NHL bets in shootouts. For example, you can take the Road team to win or be tied at the end of regulation; the Home team to win or be tied at the end of regulation; or for either team to win in regulation time (basically the same as betting that the game won’t go to OT). The obvious downside to double chance betting is the odds. Since you’re giving yourself a much better chance of winning your bet (unless you take the underdog and the draw, which is essentially the same as taking the +0.5 puck line in regulation), your payout won’t be anywhere close to what it would be on a standard NHL bet. 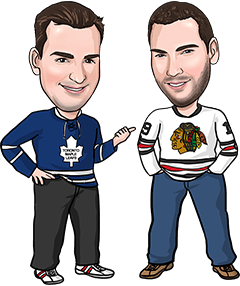 Sports Interaction, Bet365, Bodog, BetOnline and William Hill offer double chance NHL betting. Over/Under is a much more mainstream way to bet hockey than regulation time, 3-way or double chance. It’s simply betting on whether there will be more (Over) or less (Under) goals in the game than a total posted by the oddsmakers, which is typically 5 or 5.5. Since either team will only be credited with 1 goal in overtime or a shootout, Over/Under betting basically ends at the end of regulation time. For example, a 2-2 game that goes to OT will end 3-2 and with a total of 5 – it doesn’t matter which team scores the next goal, or how they do it. Any sportsbook that posts NHL betting lines will offer NHL over/under betting. Like Over/Under, puck lines are determined in regulation time. Puck lines are when the underdog is given +1.5 goals and the favourite has to “give” -1.5 goals, similar to a point spread in football. Your puck line bet will always be decided in regulation. If the game goes to overtime, the underdog will have already covered the +1.5 puck line because whoever wins the game will only win by 1 goal. If you take the favourite -1.5, you’ll often get really fat odds – but beware that 565 out of 1,230 games in 2015-16 were decided by 1 goal. By betting that the game will be decided by 2 goals or more, you’ve already cut your expectation of winning nearly in half. The downside of taking an underdog at +1.5 (besides the fact that you’ll probably have to lay -200 or higher) is the potential for an empty netter. Teams that are losing by 1 goal late in regulation always pull their goalie for an extra attacker, and that can lead to a really tough beat. However, empty net goals account for just 4-6% of the goals scored in the NHL each year, so they shouldn’t be enough to put you off a bet you really like. Puck lines should be offered at any sportsbook that post NHL betting lines.